We’re thrilled to officially introduce the upgraded Mustang6G, with a brand new look and many new features to improve your user experience! One feature we’d like to highlight is the slick new GARAGE feature which allows M6G users to create a detailed profile and photo gallery of your vehicle. Users can also search other Garage profiles by category, fields, modifications and other keywords. As you’re browsing other S550s you can leave comments/questions, likes and ratings and all of this is searchable as well. 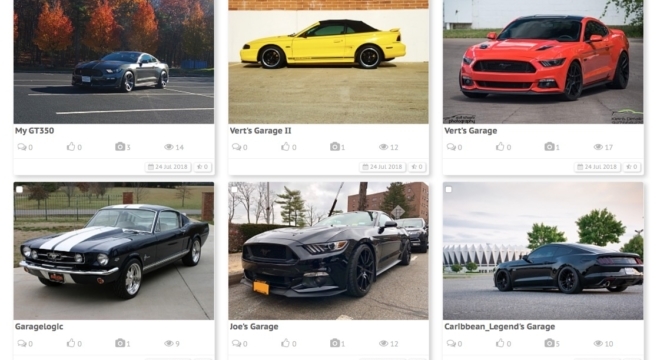 You can find the link to the GARAGE in both the homepage and forum navbar so be sure to give it a try and share your Mustang with the entire M6G community!